Munsell Color System; Color Matching from Munsell Color Company > Munsell FAQs > What is the Best Lighting for the Farnsworth-Munsell (FM) Hue Color Test? What is the Best Lighting for the Farnsworth-Munsell (FM) Hue Color Test? 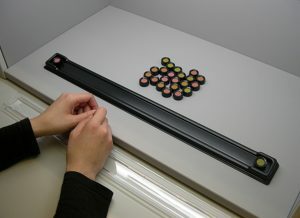 When administering the Farnsworth-Munsell (FM) Hue Color Test, it should be given under daylight conditions for accurate analysis and scoring. You want to use a certified daylight lighting source of D65 for all industries except print, where you would use D50. This is what is provided by our Macbeth Lighting SpectraLight ® and Judge® viewing booths.